Cancun's archaeological museum, the Museo Maya, is new, modern and air-conditioned and a visit can be a welcome relief from the heat outside. 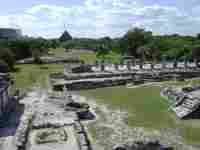 The museum consists of three large exhibition halls and houses about 350 Mayan artefacts discovered in the region. Artefacts include carvings, pottery, weapons, tools, ritual objects and burial masks. One of the highlights is the 14,000-year-old skeletal remains found in Tulum's underwater caves, which greet visitors as they enter. The museum is enclosed by lovely landscaped grounds and nestled within are some fascinating Mayan ruins, including a small pyramid. This site, called the San Miguelito Archaeological Site, is possibly the best part of a trip to the museum. Opening times: Open Wednesday to Monday 8am to 5pm.